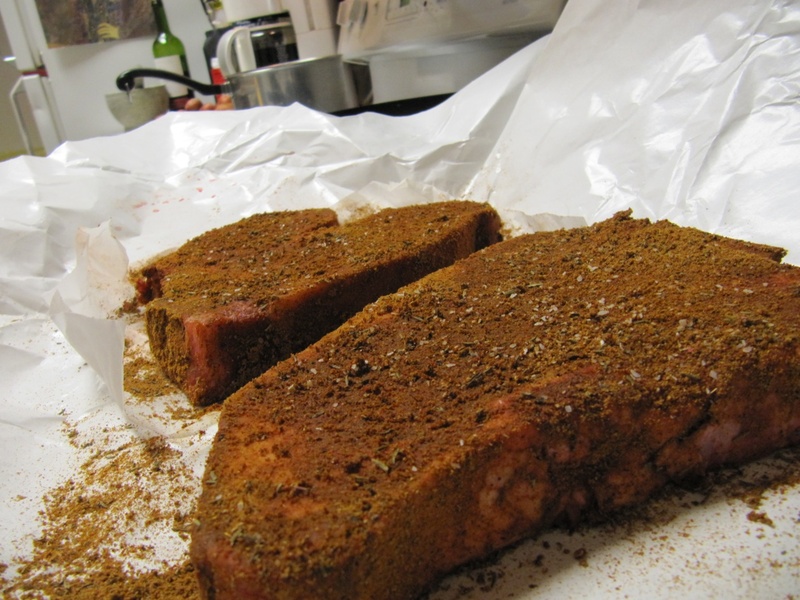 Below are the following directions for a Central Asian dry rub for a porterhouse steak. I e-mailed this to a friend (I’ve ascribed to him the name Yeoman, or the Lakota name conjou, since he is both a professor of philosophy and an organic farmer in northern Dakota). He asked about my thoughts on how to prepare a porterhouse steak, at least something different from the standard olive oil, fresh ground pepper and kosher salt. Get a bowl out. Into it add: heavy on the paprika, and less heavy on the ground cayenne and ground pepper. Put salt in there too. Then add a couple pinches of ground cloves, ground allspice, ground cinnamon, ground turmeric, a bit more of ground cumin (essentially anything that tastes like Central Asia or the Levant). I added a bit of ground thyme to mine as well. Lick your finger and stick it in to the rub, and then taste what sticks to your finger. If it tastes good, then it’s good. Then rub it on the porterhouse. Then let it sit for about an hour while you guzzle half a bottle of Malbec and devour some goat cheese you picked this up at one of those bulk stores for something like $6/lb. Also prepare some of your organic potatoes, boil water and toss in a couple of ’em with a couple cloves of garlic (mash this later with milk and a bunch of butter). Maybe chop up that iceberg lettuce in the fridge, too, since you’re going for a kind of American West Cattle Country Meets Central Asia and the Levant here. Hit the iceberg lettuce with the blue cheese dressing. Also have plenty of icy cold beer on hand in the fridge, too, because that wine isn’t going to last forever. Hope this helps. Mine turned out glorious. Having typed and re-read this, my mouth is pouring right now. This entry was posted on Saturday, November 19th, 2011 at 1:29 pm	and posted in Uncategorized. You can follow any responses to this entry through the RSS 2.0 feed.